Fred Titmus’s sweetshop holds many memories of childhood for many Hatfield residents. 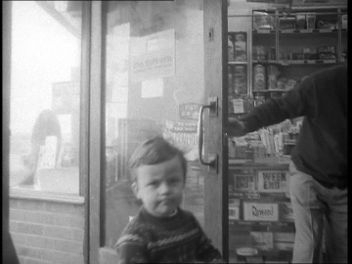 This British Pathe newsreel showing Fred in his shop, handing a boy some sweets from his counter, may spark a memory of your own. Do comment below and share your own memories. Did you visit the shop to buy sweets? Click on the image below to run the newsreel. This page was added on 21/10/2010. I went into Fred’s shop a few times hoping to see the great man and finally I was lucky, but I was too shy to say much! I was fortunate enough to see Fred bowl on quite a few occasions at Lord’s. He was so unlucky to coincide with another off-spinner, J C Laker who still holds the record for the most wickets (19) in a Test Match. I was born 5 Manor Parade in 1957 so lived next door to the sweet shop. My father worked for the DH/HS/BAe aircraft division and my mother at one time for the Dynamics side. Although my father learnt to drive (as did my mother) in the war he never did after. My mother used to drop him at Manor Parade in her car before continuing to her job. She then picked him up in the evening. My father was a regular in Fred’s shop and I got the impression got to know him quite well. In those days sportsmen used to do normal jobs at the end of their career (check out the World Cup squad of 66). Now they all seem to become experts and pundits – often not very good ones. I lived @ 6 Broadacres, remember Titmus sweet shop well. Our family lived at 36 Green Lanes and we knew Fred Titmus’s shop very well. Brother Alan was a paper boy for a couple of years and my mum Irene worked in the shop for a while during the 1960’s. Dad had a newspaper account at the shop from 1949 until his death in 1986. Every morning without fail we would get our newspaper and dad ‘paid the papers’ on Saturday morning. Mum, Irene died in 2010, age 87 years having spent most of her married life in Green Lanes. I lived in Green Lanes (No 28), from 1963 until 1979, went to Green Lanes Primary, and then to Hatfield Grammar in College Lane, and onto Hatfield School in Travellers Lane when it moved. I worked at Fred Titmus’s newspaper shop, which was then run by his father, as a newspaper boy for some time, and used to play draughts with him when the shop was quiet. I lived in Broadacres till 1973 and remember Fred Titmus`s sweet shop and Manor Parade Shops. Hatfield Garden Village was a great place to grow up in. I lived in Hatfield from 1959 until 1966 when we moved to York. I went to Green Lanes Primary and often visited the sweet shop. Not being a fan of cricket I didn’t really appreciate how famous Fred was but always remember how nice he was on my visits. Another international cricketer was Bill Edrich who played with Fred Titmus and lived a few hundred north of Fred’s shop in Green Lane. Another famous cricketer, Bill Edrich, lived a few hundred yards north of Fred’s shop along Green Lanes on the opposite side of the road. I never met Freddie Titmus but I remember his sweet shop on Manor Road in Hatfield Garden Village. However, I have met Freddie Brown who lived in Bramble Road and was captain of the MCC.